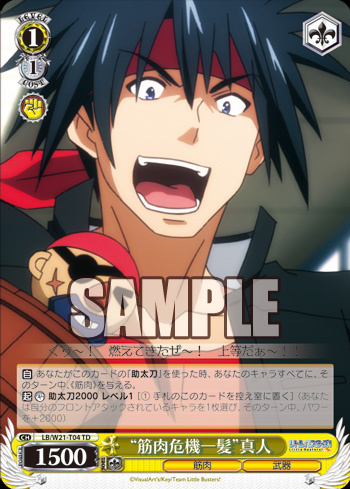 Weiβ Schwarz Cards of the Day: 8th-10th of January | TCG, shiyo? 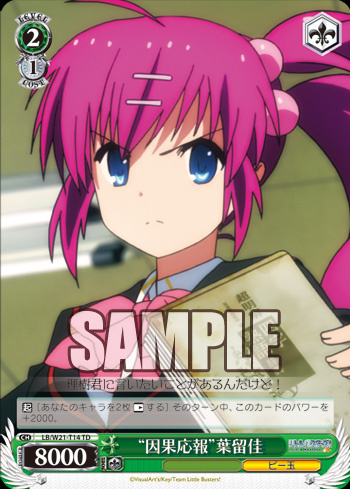 This week has been filled with plenty of new Little Busters! 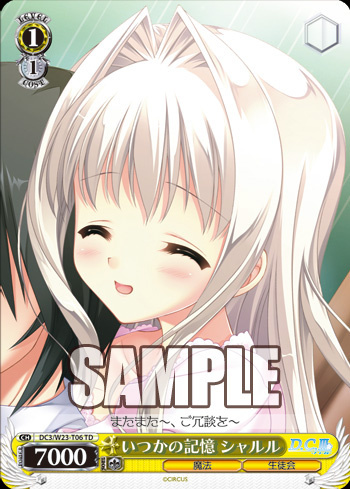 and Da Capo cards to look forwards to, and has expanded on the cast members featured. [AUTO] When this card is put from Hand to the Stage, this card gains Power +1500 for that turn. 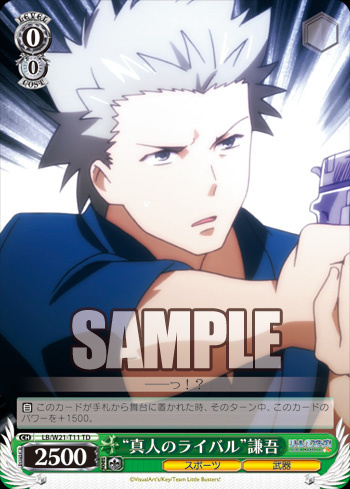 This Kengo card is the same as Sakura from the 4th, barring the fact he’s Green and has different attributes. So everything I said there equally applies here. 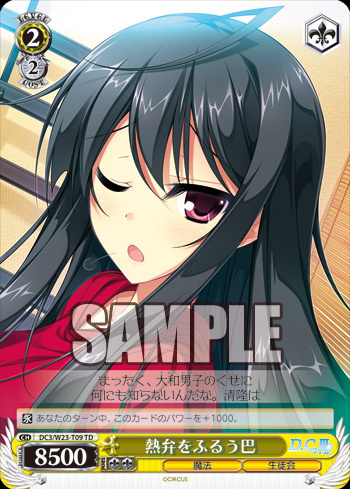 Tomoe is a straightforward card that sacrifices 500 power on the defense for a 500 gain in offense compared to a 2/2 vanilla. This can help her get over 9000 power cards, but with the fact many decks skip to Level 3 cards and a base 10000 power, I’d question how useful this would be. [ACT] [Put 2 of your characters to Rest] This card gains Power +2000 for that turn. Haruka is another straightforward attacker for Level 2, except she’s cheaper and can become even stronger. Normally she’s 8000, which is 500 below the 2/1 standard, but can easily get to 10000 when attacking, making her capable of going head to head with Level 3 cards, which isn’t bad for a 1 Stock character. Of course this means that on the defense she’s very vulnerable to other Level 2s and might even fall to some Level 1 cards. The cost for her effect should be fairly easy to achieve, since you can just Rest your Back Stage characters, but this might conflict with other effects in Little Busters!. 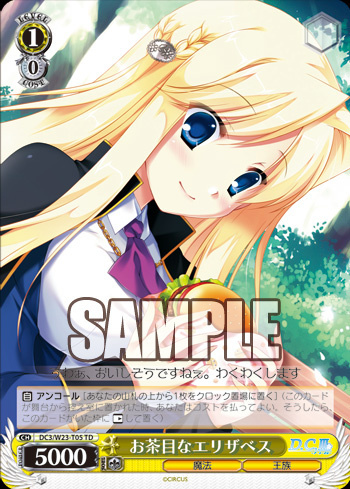 This is just a plain 1/1 vanilla, but apparently that’s a new addition to the Student Council version of the deck. [AUTO] When you use this card’s BACKUP ability, all of your characters gain «筋肉 Muscle» for that turn. Masato is more or less a standard 1/1 counter, since he gives the usual 2000 boost. However he also has an extra ability to give all your characters «筋肉 Muscle» for the turn, the usefulness of which I’m not really sure about. If there’s some kind of «筋肉 Muscle» support card, or something that gets stronger the more «筋肉 Muscle» characters on Stage I might see it being useful, but without something like this it seems fairly pointless to do that. Finally we have a Elizabeth who is a straightforward 1/0 Clock Encore. This allows you to maintain your Stage during Level 1 without sacrificing any resources, but will cause you to take extra damage. You’ll need to carefully weight the benefits of keeping her around against the fact you’ll be killing yourself faster.